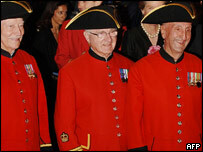 Women are to be admitted for the first time to the Royal Hospital, home to the Chelsea pensioners. The first former servicewomen are expected to be housed at the west London hospital by 2009. They will live in the Sir Christopher Wren building when the rooms, known as the Long Wards, are modernised to make them en suite. Like the male veterans, they must be former soldiers aged over 65 and receiving an Army pension. They will also wear the same uniforms as the men - scarlet coats when they are out and blue tunics on the grounds. The hospital currently houses more than 300 male In-Pensioners, as the veterans are officially known. The old infirmary is currently being replaced with a £20m updated one to comply with the Care Standards Act. The Long Wards are also being modernised and the hospital is trying to raise £35m to do this. Paul Hatt, Hospital Secretary and Director of Administration, said: "It has been a recent decision to allow women. "The modernisation of the Long Wards will allow them to become en suite for the first time and so it will allow us to offer women accommodation. "The In-Pensioners have been consulted and fully support this move."